With 20 years history of being the ABB’s distributor, Wuxi Jincheng Hairun Electric Co., Ltd. has received a good reputation from the customers. Meanwhile, it engages in explosion-proof and variable-frequency technology, discrete automation system design and environmental-protection and energy-saving transformation. With a professional team grouped by 36 high-quality and skilled members. We are engaged in the trade, technical consultation and after sales service of ABB motors. electric and mechanical drives. 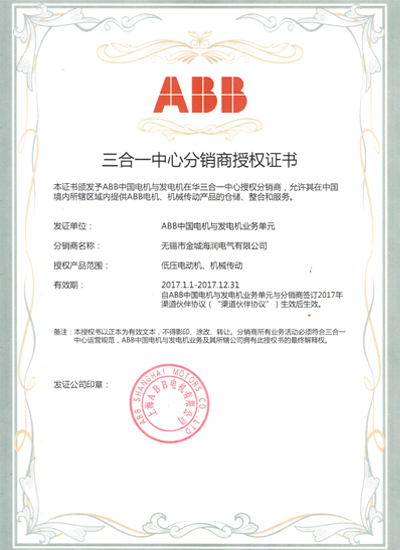 In 2000 ABB group awarded to us “Authorized Service License” and allowed us to provide service for certain ABB products in the designated territory in China. In 2009 0ur company became one member of ABB’s global after-sales service network. Our company is the exclusive user of label "ABB Authorized Value Provide” in 2012 in China. Being the “Authorized Distributor” of ABB Shanghai plant in China and stock supplier of ABB motors in Jiangsu, we will go on adhering to the business principles, “Orienting to people, respecting clients, operating business honestly, pursuing win-win and creating happiness" and acquire credit and supports from both new and old clients and counterparts with good products and swift service response.